While it's true that you can either find something to be grateful for, or something to complain about, complaints can serve a useful purpose. If you find yourself complaining, it means that there is some emotion stirring inside you very strongly that needs to be resolved. Instead of cutting yourself off, listen to yourself! What is it that you're saying? If you can identify it, the root of it, you can resolve it. This is done by either changing yourself, removing yourself from a situation, or accepting the situation as is. 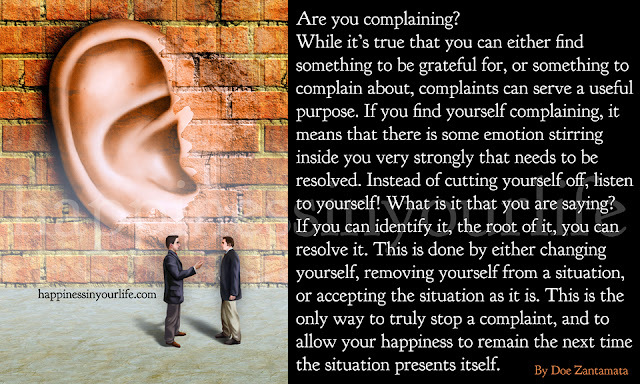 This is the only way to truly stop a complaint, and to allow your happiness to remain the next time the situation presents itself.